This entry was posted in Interactive Fiction, Walk My World. Bookmark the permalink. Brilliant! Thank you for opening up my world to several interactive multimodal composition tools. I look forward to your post each week. 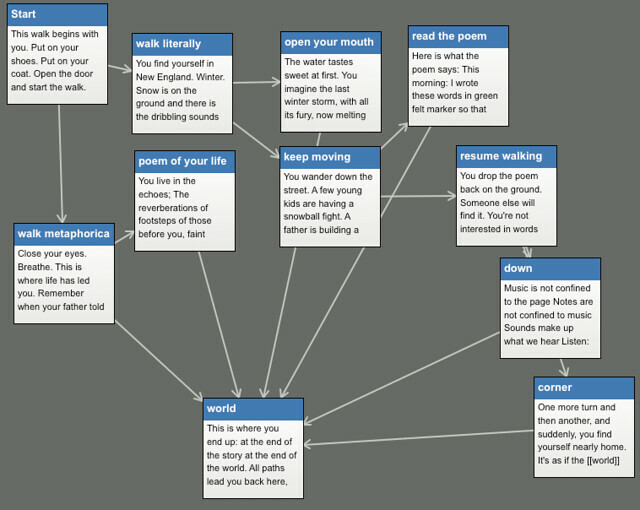 Does Twine walk the writer through the steps and options to create the connections? I love this, Kevin. When looking backwards, a life appears to have a single path, doesn’t it? Yet, the way you’ve laid out this out, it really help me see that the present is the result of the paths that were chosen and the ones that weren’t. Also, I love the poems.